Gamboa is a newbie friendly template, that offers 4 different slider options, unlimited possibilities for customization through colors, coming soon page, mobile friendly navigation, css3 animations and much more! Built with simplicity in mind and unique features as our validated contact form that works together with our intelligent PHP form processor that automatically detects fields in forms. Compatible with iphone, ipad, notebooks, laptops, mobile phones and desktops. 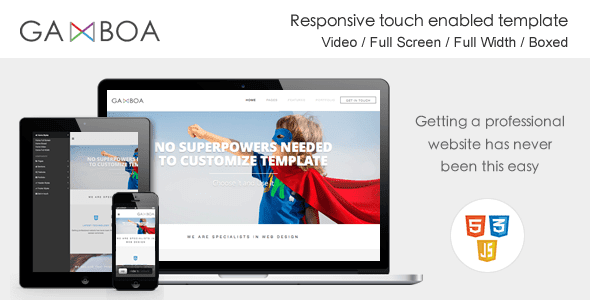 Item Reviewed: Gamboa - Responsive Touch Enabled Template 9 out of 10 based on 10 ratings. 9 user reviews.